When one hears the words Red Devil, they might think of fireworks. And that’s the feeling this band gave it’s audience. They rode high on the top of the Rockabilly Wave after playing live for only about 4 months. As a matter of fact, their sixth gig was opening for the Cramps at The Whiskey in L.A. So where did these cats (and one kitten) come from? Well, Jonny Ray was the bass master of the group. You may remember him from when he used to play with Jimmy and the Mustangs. They were a Rockabilly band ahead of their time, playing Rockabilly music when punk and new wave was all the rage. Jonny was called a child prodigy for being a red hot bass player at the young age of fourteen. But if you thought Jonny was hot, then his brother Dave was scolding. Dave also played guitar for the Mustangs, but that was in the later stages of the band. Dave added a much needed professional touch to The Mustangs. But changes happen, and the Mustangs were no exceptions. Dave and Jonny became free agents. Of course there is more to this band than the Bartel brothers. One can not help but hear the extemely strong, aggresive beat that could have only been provided by Scotty Campbell. What can be said about Scotty that isn’t already known? Well, Scotty sat in on the recording of the Rockaholic’s 12″ EP (so did Jonny Ray and Dave Lee). The album was recorded in 1981, and created the genesis for their band. Jonny and Dave knew Scotty from years before and were good friends before they formed the band. But hey, what about that pretty young thing belting out the vocals and strumming guitar? She’s Emy Lee. Emy was discovered by Dave Lee at the Cathay de Grande, just sort of hanging out with Billy Zoom. Dave saw her potential for singing and taught her to play rhythm guitar on his ’36 Gibson Electric. He soon decided that she was all that was needed to complete his four piece lineup. 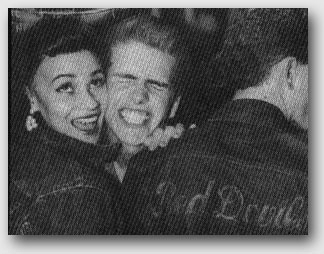 At a time when Rockabilly was fast becoming Southern Califonia’s favorite past time, this band quickly rose to the top!